So I ordered a new wig that was much cheaper and might even be a better color. 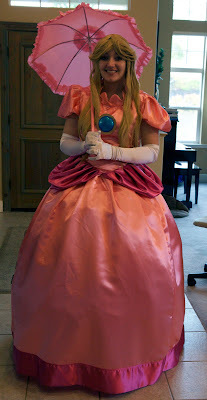 Just wanted to let you all know that Princess Peach is ready for Fanime and Anime Expo! Here's a WIP shot I took the other day. Enjoy! I'm dressing up as Peach for Halloween, so I was just wondering where and what brand of wig you ended up purchasing? Love your cosplay and tutorials by the way. @Anonymous Hey! Glad to hear the tutorials are helpful. If you have any more questions, please feel free to ask. As for the wig, it's pretty hit or miss on ebay. I sadly can't find the name on my ebay purchase history, but I generally look for reliable sellers with good ratings, and I went for a more natural Peach wig (a strawberry blonde) as opposed to the yellow you often find on cosplayers. Let me know if I can help out more! Thanks for the quick response. :) I do have yet another inquiry. I was wondering what hardware store you two found the pvc for the crowns at. I've already tried both Home Depot and Osh. Hi there! So, looks like this reply is about a year late. You can see our crown tutorial in a different post, but we did pick up our PVC pipe at Home Depot. Maybe you can check different stores online and see what they carry? Sometimes they don't have it in store at that time, but you can order it and have it shipped there. Good luck!